It’s November. It’s Oscar/Christmas blockbuster season. Let’s just get right to it, shall we? The Plot: Environmental apocalypses: the best kind (?). As a terrible blight continues to wipe out crops across the world, scientists (mainly Michael Caine) realize that the earth is done for. That doesn’t necessarily mean that humanity has to be, though. Of course, finding a crew to pilot a mission through a mysteriously opened wormhole in search of an inhabitable planet is sort of hard. Astronaut-turned-farmer Cooper (Matthew McConaughey) is the best man for the job, and agrees to accompany Brand (Anne Hathaway), Doyle (Wes Bentley), and Romilly (David Gyasi) on a doomed mission to retrieve the data from the twelve previous, now lost missions into this strange new galaxy. As he ventures into the unknown towards a gargantuan black hole with such a powerful force of gravity that it manipulates time, Cooper has to confront the truth that even if he succeeds and returns to Earth, the children he left behind may be unrecognizable to him, or dead. Right at the onset, we should be incredibly wary of a few things, chiefly space and time. When is time travel ever not messy? Well, I have good news for all y’all. This film is written and directed by Christopher Nolan (Memento, The Dark Knight Trilogy, Inception, The Prestige), and Christopher Nolan likes science. My understanding of things said by people who actually know what they’re talking about is that Interstellar is about as scientifically accurate as sci-fi blockbusters come. This isn’t a case of accuracy for its own sake, however, and while a scientist well-versed in theories of black holes and time travel might appreciate certain aspects on a deeper level than, for example, I would, an understanding of the imbedded machinations is not all that important. The story needs its science in order to properly function. Without it there, the whole movie falls apart. Nolan and his brother, also Nolan, have crafted a perfectly intricate and layered narrative in which science and faith, logic and emotion all exist in mutual codependence. The end result is a film unique in its sense of balance. Ideally, all sci-fi would be equally character- and science-driven. Tears, for example, are emotional, but also… science. Yeah. An example of this (and very minor spoiler, I guess): at one point the astronauts are stranded on a planet for an hour. Doesn’t sound so bad, does it? This planet is dangerously close to the pull of the black hole, though, and time moves at a completely different rate there than on Earth. When their hour has elapsed and they return to the space station, Cooper and his crew are shocked to discover that twenty-three years have passed back home. In what is easily the most heart-wrenching scene in the movie, Cooper sits down to watch over two decades of video messages sent from his kids. In an hour, they’ve grown into adults, they’ve learned and lost, they’ve made him a grandfather, and—most devastating of all—they’ve passed him in age. Yeah. His kids are older than him. Not only is this excellent acting fodder for McConaughey and his now adult children (Jessica Chastain and Casey Affleck), but it is exactly scientifically accurate. They even calculated precisely how far from the black hole the planet would have to be in order for time to progress at such a rate. Although, gosh, your daughter grows up to be Jessica Chastain. Can’t really feel bad about that. That sounds like an awful lot of effort for a blockbuster, doesn’t it? Yes, but it doesn’t sound like too much for a leading specialist. Rather interested in the topic and wanting to be accurate, Christopher Nolan consulted current black hole authority Kip Thorne, who did all the math and acted as the scientific counsel for the film’s special effects team. I am here to talk about a movie, though, and while in this case the film and the science are truly inseparable, I entertain no pretense to suggest that I am qualified to discuss astrophysics. If that is what—as the (English) kids say—tickles your fancy, I recommend you read this article. If you’re more interested in how this functions as a movie and how the characters and story develop, I would HIGHLY (and selfishly) suggest that you remain on this page, and avoid navigating away at all costs. You never know what could happen to you following mysterious links. You could get a virus. Geez, dude, exercise more caution while surfing the web. It’s a dangerous business, going out your door. But seriously, the visuals are staggeringly beautiful. Leaving the impressively obsessive science behind, let us now focus on Interstellar simply as a story about people. At its heart, this boils down to a very unpretentious father/daughter narrative. The nice thing about all Christopher Nolan films is that they are always something very simple and familiar, presented in a convoluted and original manner. The Prestige is a revenge tragedy; Inception is every single heist movie you’ve ever seen. The two themes that seem to pop up in almost everything he does are (A) lying for the greater good; and (B) parent-child relationships. Unsurprisingly, Interstellar sports both. If you strip away the layers of intergalactic travel, apocalyptic stakes, philosophical musings on humanity’s place in the universe, mind-bending representations of third, fourth, and fifth dimensions, and all those amazing visuals, what remains is Cooper’s undying love for his daughter (noticeably not so much for his son, but…), and that’s a relatable story. It acts as an anchor for the audience when all the other stuff gets to be too difficult or complex for the casual moviegoer. 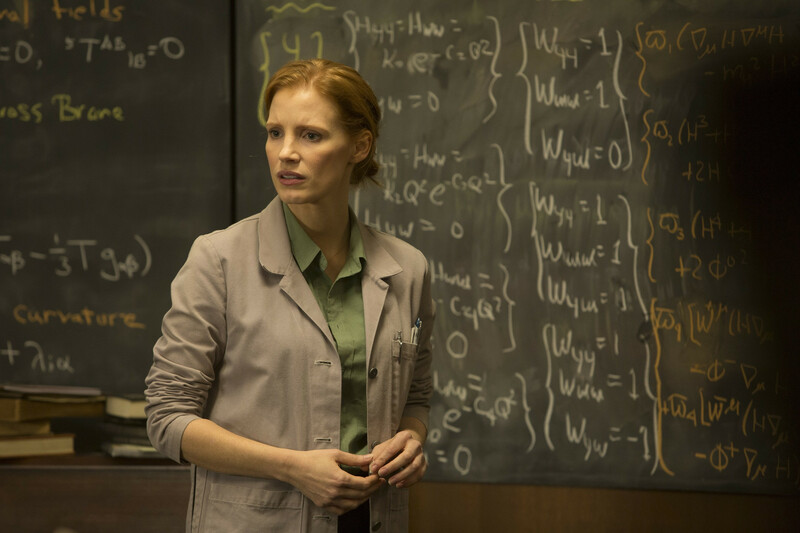 So, Interstellar is about a father-daughter relationship and science. It devotes all of its time and energy to those two things. Unfortunately, this means that some of the other characters are poorly realized or underwritten. 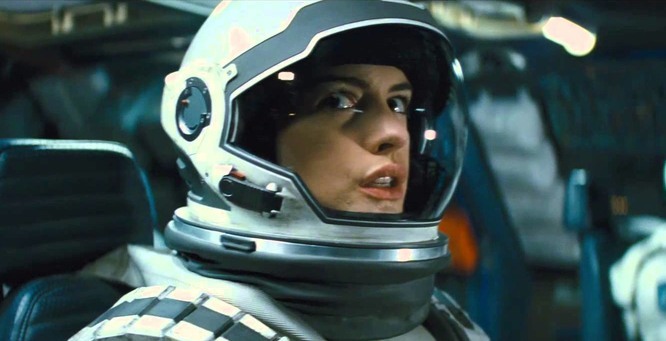 While Anne Hathaway’s Brand is fully developed and complex, the Nolan brothers seem unable to provide the same depth to the other two astronauts, who ultimately get shortchanged so much we wonder why they even came along in the first place. Similarly, there are a couple characters who are truly superfluous to the narrative of the film. For example, Topher Grace is in this movie, totally without reason. He appears to operate primarily as a mirror, something Jessica Chastain can bounce ideas off of until she sees the truth in herself. This weird robot is a better character. I found this problem to be a real pity, as I think the Nolans, as writers, are usually more than capable of handling ensemble casts. Their stories invariably focus on the trials and tribulations of one man, but that man is generally surrounded by a group of compelling secondary figures. Think about Batman Begins. The focus is Batman (Christian Bale), but Alfred (Michael Caine), Lucius Fox (Morgan Freeman), Scarecrow (Cillian Murphy), Falcone (Tom Wilkinson), Rachel Dawes (Katie Holmes), and especially Ra’s al Ghul (Liam Neeson) are all fully realized and interesting. They each have a complete arc that does justice to them and simultaneously facilitates Batman’s arc. In Inception, the supporting cast is not quite as developed, but they are just as complex as they need to be for Cobb’s (Leonardo DiCaprio) story, and for the overall theme of the movie. Interstellar has a massive cast, but only about four fully engaging characters, Cooper, his daughter Murph, Brand, and (spoiler alert) Mann (played by Matt Damon, who shows up unexpectedly about two-thirds of the way through). Interstellar’s other major flaw is its length. It finally wraps up near the three hour mark. Nolan’s films are frequently long, but they’ve never felt overlong. Whether they’re an hour and forty minutes or two hours and forty minutes, they seem to be the appropriate length. 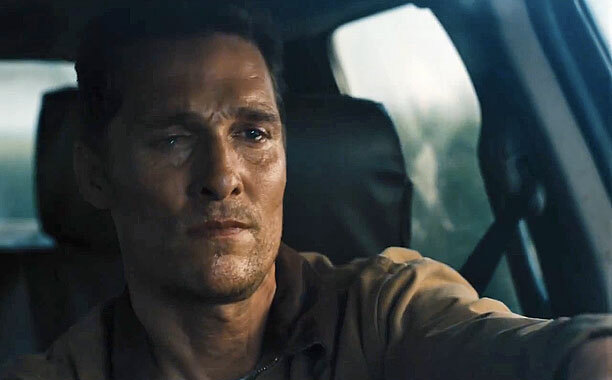 Interstellar easily could have ended fifteen minutes earlier. A lot of audiences will struggle with the film’s ending, which does abandon some logic for the sake of wrapping up its human story. This didn’t bother me, because I’m the type of viewer who vastly prefers a satisfying character arc to strict scientific accuracy. What bothered me was that it concludes itself about three times over the last twenty-five minutes or so. It kinda goes all Return of the King on us at the end. Similar to the complaint of the tertiary characters, this is an unusual flaw for Nolan, who generally wins major points in the last two minutes of a movie, often with a moving montage set to some inspirational Hans Zimmer music. And here’s a picture of Anne Hathaway. IN SPACE. Oh yeah. Though lacking in the moving montage, Interstellar does boast some pretty excellent music from Zimmer. I’ll have to ask my more musical brother for his professional opinion, but it struck me as being a much more complicated and stylistically original score than some of his other, occasionally redundant work. All in all, I still consider Christopher Nolan’s career spotless. 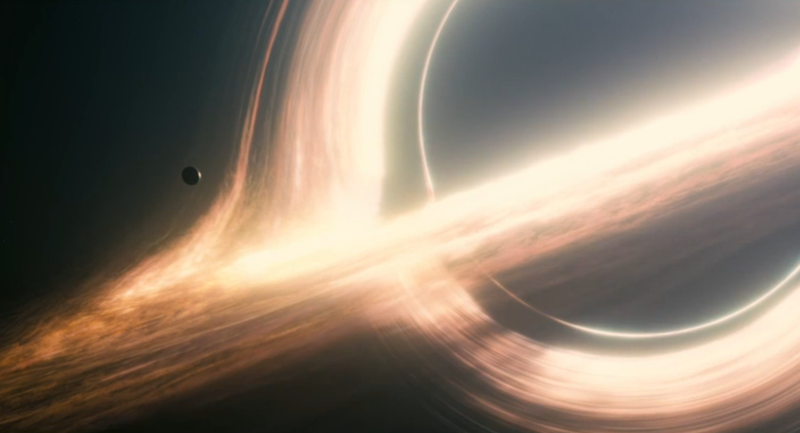 Though Interstellar certainly has its problems, the things it gets right far outweigh them. It redefines the bar for accuracy in science-fiction, acknowledging that that word is split evenly between “science” and “fiction.” Seven letters each, guys. 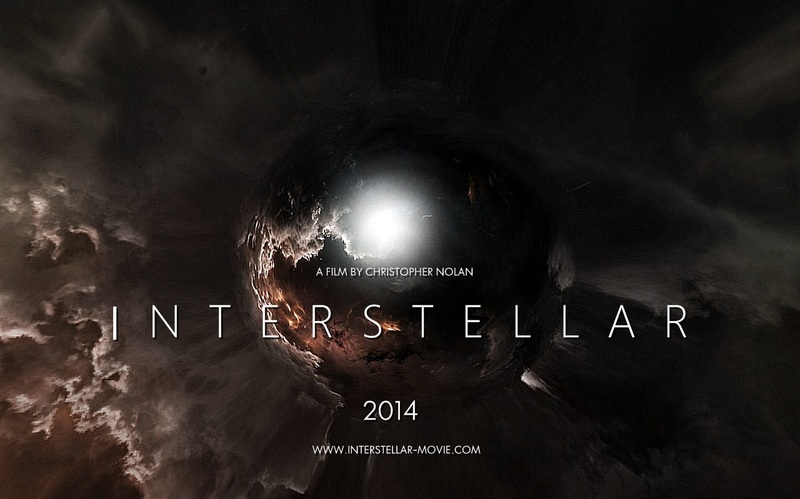 Visually, Interstellar is this year’s Gravity or Life of Pi; they’ve got that Oscar squared away, anyway. The viewing experience is truly stunning, and I would highly recommend seeing this one in theaters.